Hard hats are intended to protect workers’ heads. What’s this worker doing to undermine the effectiveness of his hard hat? Hard hats are a key piece of PPE, especially on construction sites. But if workers don’t wear their hard hats—or wear them incorrectly—they can undermine the effectiveness of this safety equipment and thus put their heads at risk. 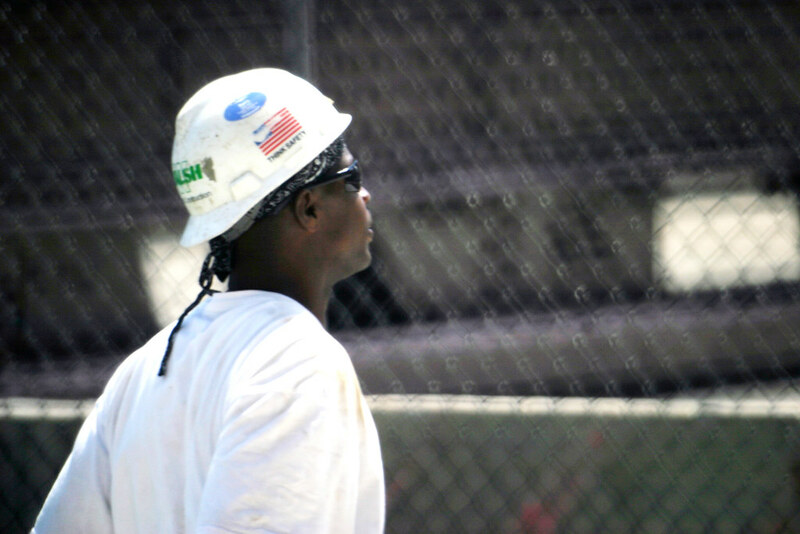 This picture shows a worker wearing a hard hat backwards, which is generally unsafe unless permitted by the manufacturer. And even then, wearing it backwards may only be permitted for certain tasks or if the worker also reverses the hat’s inside suspension. In any event, the brim of the hard hat clearly isn’t doing anything to protect items from hitting the worker’s face when it’s turned backwards. Wearing hard hats and doing so properly can literally mean the difference between life and death. Hard hat saves worker: A 70 lb. metal beam fell from the 7th storey of a condo development and struck a worker on the head, face and torso. He was taken to the hospital in serious condition but survived. Police credited the worker’s hard hat with saving his life. Lack of hard hat results in fatality: A worker delivering wallboard to a construction project parked his truck and stepped from the vehicle when he was hit by a one-pound tape measure, which had slipped off the belt of a worker at the top of the tower under construction. The man, who wasn’t wearing a hard hat at the time, was struck in the head and knocked unconscious. He was taken to the hospital, where he died. The use of safety headwear is generally required when workers are exposed to the risk of injury to their heads by falling, flying or thrown objects, or other harmful contacts (such as with hazardous substances or electricity). And some workplaces, most notably construction sites, are presumed to pose a safety hazard to workers’ heads and so safety headwear is usually required by all workers in such workplaces. Next, determine the appropriate type of safety headwear, which in most cases will be some type of hard hat. This determination may be based on the nature of the head hazards. For example, if a worker may be exposed to electrical hazards, the safety headgear should have an appropriate non-conductive rating. And most jurisdictions require safety headwear to comply with a standard such as CSA Z94.1‐05, Industrial Protective Headwear. In addition, your hard hats may need to be red, orange or another very visible color or have reflective decals if worker visibility is a safety issue. You may also need to ensure that workers have liners for their hard hats if they’ll be working in or exposed to cold conditions. And safety headwear may require some kind of retention system such as a chin strap if workers are working at heights, in windy conditions or in other circumstances in which their hard hats could get dislodged. Painting hard hats or affixing decals to them. As always, train workers on your rules for safety headwear and ensure that workers understand these rules and comply with them on the job. For example, give them this handout as an accompaniment to a toolbox talk on head safety. You should also periodically review these rules with workers. Perhaps the hazard assessment showed that hats worn backwards are fine. all in all this worker is well within his rights at least here in Alberta. The only problem I see with this pic is the fact that the worker has a bandana on under the hat which would compromise the fit. that is the only thing that would be considered unsafe with this pic and you didn’t even mention that!